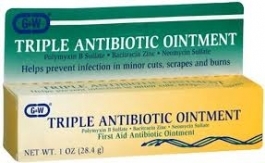 Naturally heal and disinfect wounds with Actavis' Triple Antibiotic ointment. This ointment soothes hurting, throbbing areas and eliminates germs. Preventing infections caused by scrapes and minor cuts and burns, this ointment provides First-Aid-quality, germ-fighting properties. May also help prevent scarring from minor cuts. Active Ingredients (in Each Gram): Bacitracin (400 units); Neomycin (3.5 mg); Polymyxin B (5,000 units). Inactive Ingredient: White Petrolatum.